Venuefind Group was created in February 1994 by a group of former senior hoteliers determined to create an agency with an ethos based on fresh thinking, big ideas, cost effective solutions and excellent execution. Our strengths are encapsulated in the creative energy of our events and production teams, in addition to the dedication of our entire highly experienced workforce. VF Group‘s London based team are leading providers to the corporate events and production markets. We specialise in working closely with our clients to improve event performances, reducing costs and improving standards. Always aiming to add significant value to our clients meetings and events, helping them to improve performance through the innovative solutions that we provide. 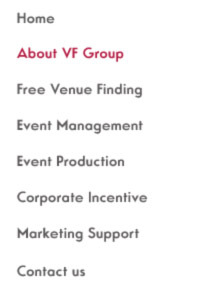 VF Group offers a fully comprehensive Meetings and Events delivery service from FREE Venue Finding, Event Management, - Full Event Production to Corporate Incentives and Marketing Support. By bringing heaps of experience to the party we always aim to deliver results for all meeting and event needs by using the most cost effective means possible. It is however our track record that shows our true capabilities, which is evident by the level of client satisfaction and repeat business that we generate. If you have a meeting, exhibition, conference or event in London or in any worldwide location such as Europe, South Asia, Middle East or USA and would like to discuss with us, why not give one of our team an obligation free phone call to see how we might start to play an active role in assisting you to realise your events potential, or you may simply require our skilled venue finders to source a suitable venue for a B2B conferences, seminars, exhibitions, training courses, product launches, and round table events to highly effective events such as Olympic events, festivals, outdoor events, fashion shows, incentives, high profile parties and gala dinners. Of course again this service is completely free of charge. The people of Venuefind are that rare breed of professional that routinely go the extra mile to solve problems and foresee others before they occur. They're also remarkable in that they are equally excellent communicators (who actually return calls promptly too!) and extraordinary, creative organisers. Venuefind is the resource for which I've been looking for years!